When it comes to the boys track program at Bridgeport High School, some may consider it by two different terms. There’s the BG period and AG period. The B and the A stand for the before and after. The G is for Griffith as in long-time Indians boys track coach Jon Griffith, who also assumed the role of the head coach of the cross country program in recent years. There’s a reason for the BG and AG period when it comes to Griffith, BHS and the track programs (and even the cross country programs). The time before his arrival is sprinkled with a few bursts of success. The time after his arrival is dominated by it. Before we get to the accomplishments of the programs and the student-athletes under his watch, it’s wise to first know that Griffith has been coaching for a long time. 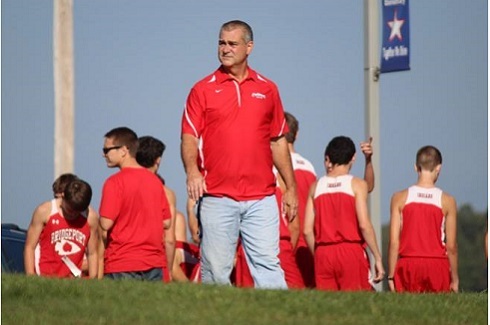 In fact, this past year marked his 30th season with the track program and it was his 10th with cross country. 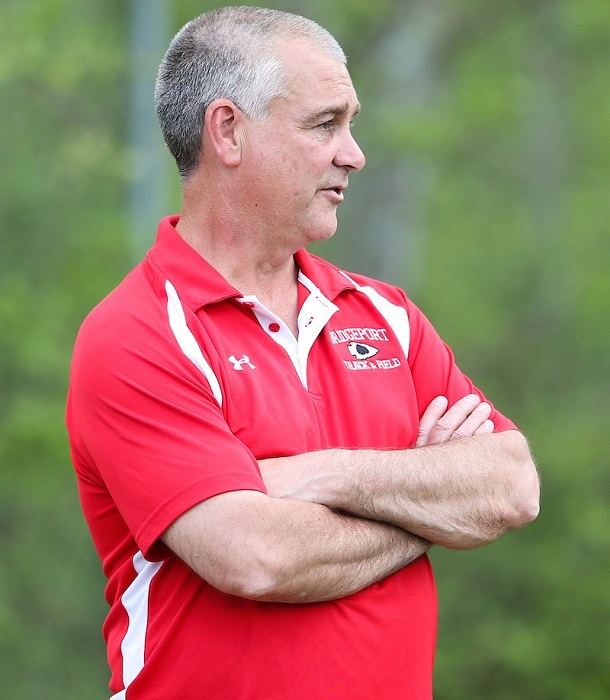 “I had no idea that I’d do it this long and it started when I first came here as a student teacher and asked (Assistant Principal) Jim Romeo to volunteer for the team as a coach,” said Griffith. That was likely good news to Romeo. The boys track program had seven members at the time. 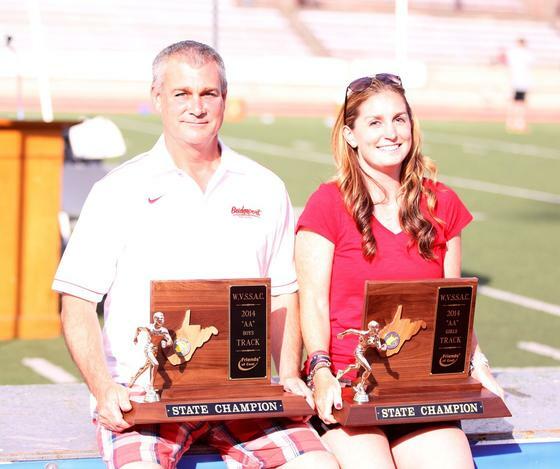 “One of the track team members’ mothers was coaching, Elaine Teter, whose son Mike was on the team. She was a teacher and excellent to work with, but she was coaching because no one else would,” said Griffith. The lack of interest was in stark contract from where Griffith grew up. He was a track athlete in South Charleston and was a sprinter and also threw discus. “I ran track and field since junior high and all through high school,” said Griffith. While he loved the sport, he didn’t have eyes on a coaching job, let alone a teaching one. When he went to West Virginia University, he earned a bachelor’s degree in chemistry. He found out quickly he didn’t want to work in a lab all day. Griffith landed as a student teacher at the former Bridgeport Junior High School. That was the year he ended up volunteering. “I think (Teter) was relieved to have help, but what a great lady. 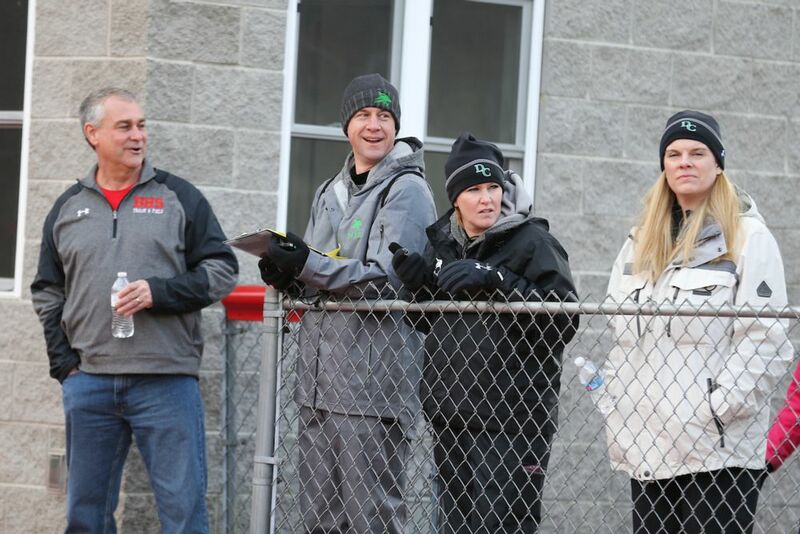 I think she would tell you track coaching wasn’t her specialty, but making sure the kids had a chance to compete was a specialty and that can’t be overlooked,” said Griffith. The next year, the job was open. Griffith applied. The rest, well, is championship history. Part of the issue was related to Bridgeport’s facilities. The Indians ran for much of the first part of Griffith’s career on a cinder oval that was, at best, mediocre. For the Kanawha Valley product used to running at Laidley Field and at meets in the area where most had a rubberized surface, it was hard to get used to. Early on, there were more mud puddles and worms on a track with no exchange zones, lane lines, high jump or pole vault areas and only a few beat up hurdles. To use the hurdles, athletes lined up on the roadway between Johnson Elementary and Bridgeport High School. It was that bad. Fortunately, the dismal scenario gradually changed. In 1999, Griffith and former girls’ track Coach Jim Dawson teamed up with a trio of community leaders who decided the track wasn’t acceptable for the school or the community. The coaches joined Bob Riley, Steve Sellas and the late Denny Paul to begin the “Track to the Future” program. In 2002, the effort was complete. BHS had a brand new, all-weather six lane track and began to host home meets and have a reliable pra ctice area. 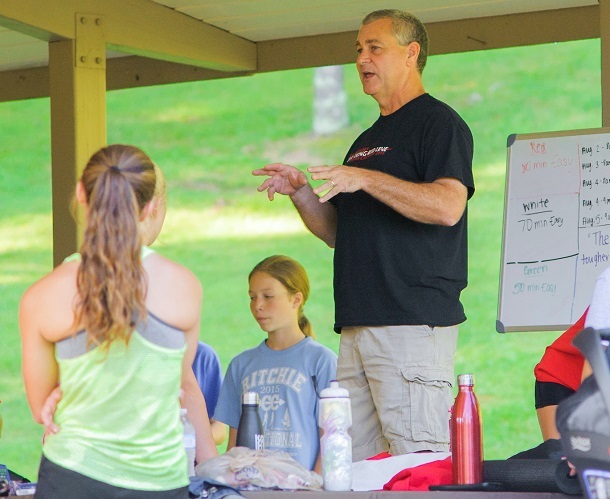 “The practice was huge, but we suddenly had a program that could make money thanks to hosting meets and we’ve done that ever since,” said Griffith. While the track was a difference maker, in the early 1990s the Indians were beginning to win Harrison County championships. By the mid-1990s Big 10 victories came and an occasional regional. The numbers were also growing. From that first day with seven athletes, the numbers continually climbed. They’ve not only come out, but they’ve won. The program’s history from 1923-1988 – the first 66 years of competition – saw eight all-state athletes, one individual state champion, zero relay state champions, one Harrison County title, and zero Big 10 or regional titles. 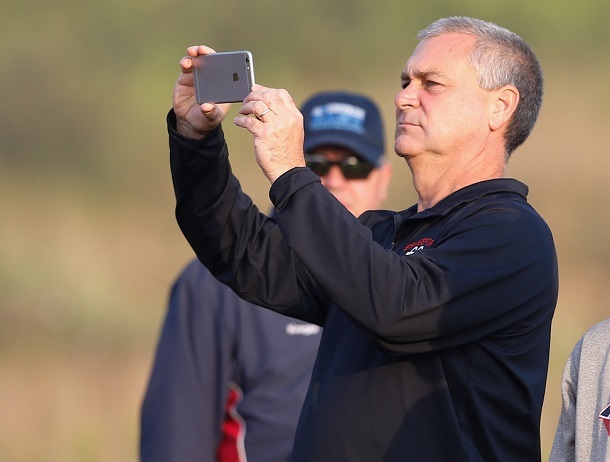 The club managed to score a total of 26 points at every state meet in the first 66 years and, not surprisingly, never whiffed a state title or even a runner-up slot. Since Griffith became involved, the numbers changed. And the change is jaw-dropping. In the last 30 years, the Indians have had 295 all-state athletes, 10 individual state champions, four relay team state champions, 25 Harrison County championships, 22 Big 10 titles, and 11 regional titles. At the state meet level, the boys’ team has scored 722.83 points with two state championships and a runner-up spot. “This success was our goal from the start, but I was never sure we would make it,” said Griffith. “Between the facility improvements, us working to promote the sport and having former athletes come back and help with coaching, it’s just been huge. It does. At least it does when you look at BHS cross country. In the programs first 15 seasons (including a solo year in 1978 before it resumed in 1994), there were three Harrison County titles to hang their hat on for the boys and two for the girls. After that, it was almost a complete wash. The Indians boys and girls teams had zero Big 10 and regional titles, zero all staters, zero championships and only two athletes – both for the girls – earned all-state honors. Since Griffith joined as an assistant in 2008 and took over as head man in 2012, things have changed drastically. The boys have 10 county titles and the girls have nine. The Tribe has won the Big 10 four times and their female counterparts have two crowns. On the regional front, the boys have five titles and the girls three. At the state level, the boys have won three state championships and finished as runner-up. The girls haven’t won a title, but have qualified the team for the state meet six times (the boys have done that seven times). Six boys have earned all-state honors, including one individual boys state champion. Four girls have snagged all-state during the same time period. So how much more is in the coaching tank? 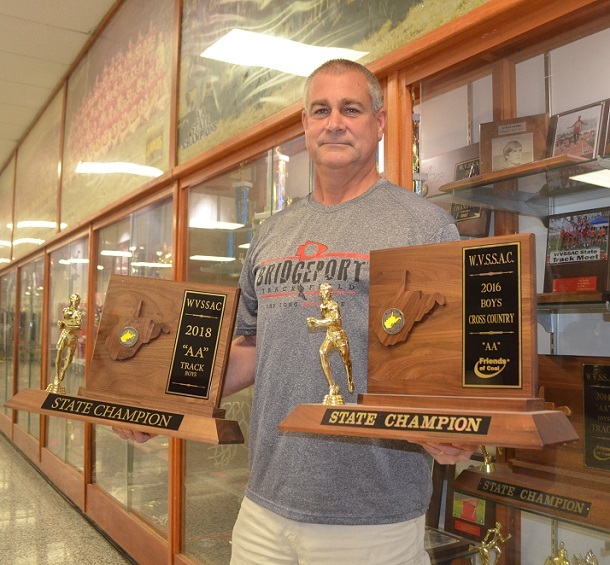 At a minimum, he’s got five state championships that say it’s actually been a great 30 years.